It hit me last night, as I was cleaning up the kitchen and trying not to wince at the shrieks and bumps and giggles from the basement: She's doing this on her own now. 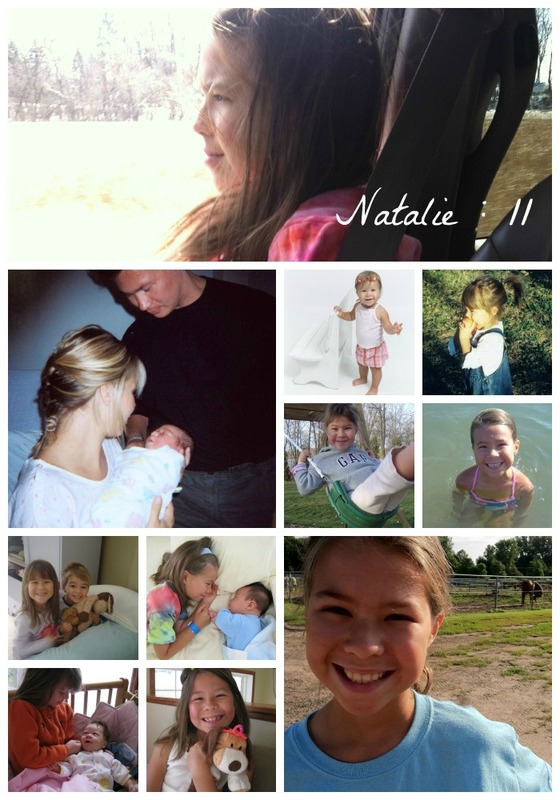 My Natalie, who was born red and bruised 11 years ago today, is all grown up. Sure, she's got more growing to do. Her slender body is just whispering curves, and she still plays Polly Pockets and takes her favorite stuffed dog to the playground, and she rolls her eyes with disdain at the teenagers trying to look cool. We have years together yet, she and me, and I long for them to be full of learning and laughter, of delight and discovery. But she doesn't need me to do things for her anymore. She can dress herself, bathe herself, do her chores without reminders (usually). She can entertain herself, make lunch for herself, stay home by herself and even pull off an entire birthday party without me. It's one of those changes that sneaks up on you, that in hindsight, I should have seen coming. But Natalie being my oldest, this development caught me off-guard. For the past 10 years, I've been the birthday party planner. I've come up with the theme, planned the games, baked the cake, bought the snacks, invited the guests, decorated the house, supervised the festivities. I've gone from First Birthday Girl pink gingham to obsessed-with-Shamu underwater friends to this-year-I'm-obsessed-with horses to let's-go-swimming. It was a lot of work and a little stress, yet I loved every bit of it because I love parties and I love my girl. But this year? I didn't do a thing. Natalie started talking about her party in January, a full six months before her birthday. I tried to put her off, but she couldn't hold back. By early spring, she decided on a sleepover party. ("Wait. We haven't even talked about themes. Do you want to hear my ideas for a purple party?") By April, she had a three-ring binder filled with ideas and recipes and schedules. In June, she started hoarding recycling for the various crafts she had planned. And by July, she was in full countdown mode. "Just three weeks until my birthday." "Just two more weeks!" "Do you know what's happening in 10 days? My party!" Almost every conversation we had the last few months circled round to the sleepover. It got to the point where Corey and I had to mock her a little for the fixation. "Hey Natalie. We haven't talked about your party for five minutes now. Are you OK?" But true to her word, she has it covered. Last night she and her friends played dress-up and watched Gilligan's Island and "bought" treats from a vending machine Natalie made from an old box. They stayed up late, but the giggling was contained to her room. And so far today, they've eaten chocolate chip flapjacks for breakfast, gone swimming, solved a mystery (complete with clues) and now they are watching a movie before having chicken tacos and sundaes for lunch. My contribution to the party? I cooked the food. I corralled the little kids. And I made the guest of honor. She might not need me in the same way anymore. She's growing up and growing into herself. But I know she'll always need my love and my support, my hugs and my cheerleading, my wisdom and maybe even my sense of humor, especially as she enters the in-between years. I'm glad there are some things she can't outgrow. Mama, I just got chills!!! PS - "I made the guest of honor." That made me giggle! It sounds like her party has been a lot of fun! And you are a nice mom, for such a lengthy amount of time for a sleepover. I'll look forward to how your relationship grows as she grows--my oldest will be 11 in October. This is lovely, Kelly! Happy birthday to Natalie. This was beautiful. Happy Birthday to your Natalie! Happy Birthday to one of the best niece's in the world! I remember clearly the day (or night) she was born... It's hard to believe that she is 11! So wish we could be there to celebrate her BIG day. Love you guys!! PS- Is her favorite stuffed dog still Kipper? It sounds like you might have a future party planner in your hands! Happy, happy birthday to your beautiful girl! My heart aches and rejoices with you. It's so wonderful to watch them grow but not always easy to let them go! A slightly belated "Happy Birthday" to your lovely girl! Oh, Kel. No words. Love this.